Apple’s online store went down this morning, which is normal before big Apple events, and when it came back up, not only had Apple added the newest iPhones and Apple Watch, but it had eliminated an old friend. 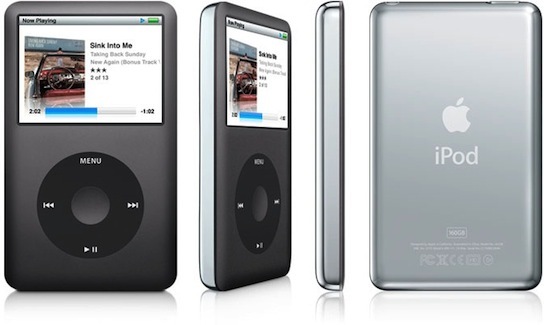 When you navigate to the iPod section, you will no longer find the iPod Classic, Apple’s legacy portable music player with a 160GB spinning hard disk. The demise of the iPod Classic isn’t a surprise — it still uses the old 30-pin connector, and Apple surely wants more people to stream audio through its Beats app — but it’s still the end of an era. I bought the very first iPod on first sight. Less, shall we say, visionary people mocked me as gullible gadgeteer. Frustrated but confident, I immediately bought a bunch of Apple stock. At $10/share. If I didn’t already love Apple, and i do, any company that gives me a 7000% ROI is deserving of loyalty. I still have that original clunky iPod; not selling it.. The other *outstandingly amazing* thing about Apple is the retirement of the click wheel. Think about that. A massively successful product which they themselves obsoleted with the intro of the touch interface. Innovator’s Dilemma my eye! If Microsoft had (somehow) stumbled upon the click wheel I’m betting that, ten years later, we’d still have click wheels with only cosmetic differences. The other *outstaningly amazing* thing about Apple is the retirement of the click wheel. Think about that. A massively successful product which they themselves obsoleted with the intro of the touch interface. Innovator’s Dilemna my eye! If Microsoft had (somehow) stumbled upon the click wheel I’m betting that, ten years later, we’d still have click wheels with only cosmetic differences. This has been expected for a long while, however, it is still kind of sad.